Out, Damned Spot: Is This The Answer To Adult Acne? …Three, four, and before you know it, a cluster of obnoxiously palpable pimples (read: visible from space) take up residence on your chin. Be in swarms, or ridin’ solo, they attack your otherwise glowing skin with gall and tenacity. And whilst a big ol’ zit typically suggests teenage angst and parental warfare, adult acne is a real and very pertinent problem. It’s also one of the most difficult to treat. We asked Dr Vivian Tam of Cosmetic Acupuncture Melbourne, and founder of the latest product to prize-fight adult acne, Zilch Acne Formula, exactly what adult acne is and how to tackle it head on. Why do some people get adult acne? From a Chinese Medicine point of view, there a number of patterns and imbalances that are commonly seen in those who have been suffering from adult acne. An imbalance of heat in the body can cause an accumulation of inflammation and cause the skin to breakout. A perfect analogy is the Earth’s core getting too hot, causing eruptions on the surface (volcanoes!). The build up of toxicity in the body is also a major pattern that Chinese Medicine correlates to problematic skin – this can sometimes come from poor circulation or digestive issues whereby the body cannot properly eliminate toxins. Blood circulation in Chinese Medicine is integral to the optimum wellbeing of one’s health, and promoting healthy blood circulation for skin health is no exception. When there is blood stagnation (blockages) in the body, swelling and inflammation and build-up of toxicity can occur. To better understand this concept, imagine a blockage in a car engine – eventually this blockage will cause the car to overheat, and “blow up”, similar to the body accumulating inflammation and toxicity, causing breakouts. How does it differ from teen acne and hormonal acne? What does it look like? Adult acne is acne that affects those beyond the teenage / pubescent stage in their life and can be caused by anything from an imbalance of hormones, to stress factors, lifestyle factors or diet. It usually presents as larger, more inflamed whiteheads and cystic nodules – that is, they are large, red and deep – and commonly affect the jawline, cheek, chin and temple areas. Teenage acne is acne that you get when you’re in your teens (age 11 – 18 more predominantly); however, it can differ in the type of pimples that come up too (ie: teenage acne can often start as smaller red whiteheads and surface pimples, as opposed to the deep cystic nodule type of acne pattern that adult acne can often become). Hormonal acne is specifically acne that is caused by an imbalance or fluctuation of hormone levels in the body – and hormonal acne can occur at any age. Adult acne can often be very stubborn, and because it can come on very suddenly, people are often left confused as to what they can do to help. Stress plays a big factor in the development of adult acne, so forms of stress relief like yoga, meditation, exercise or speaking to someone are going to be an integral part of your skin wellness. The obvious diet changes, like trying to avoid or reduce dairy, wheat and sugar, can be helpful. It’s not something most people are aware of, but there is such a thing as a yin / yang time on the clock, so sleeping early (instead of the 2 – 3am bedtime teenagers have!) allows your body to catch up on building back up and balancing what it needs. If I was going to say anything about skincare it would be this: avoid harsh chemicals and ingredients that dry out your skin! Most people start using oil-free and harsh creams, but it only dries out your skin, throwing off the oil production balance in the skin. You’re also at risk of irritating an area that is already sensitive. can you explain how Zilch actually works? Zilch Acne Formula works in several ways, providing real, long term results for acne sufferers. Firstly, it works on reducing inflammation in the body and skin – reducing the soreness, redness and uncomfortable swelling of larger cysts and nodules. These large and cystic nodules can be due to blood stagnation – blockages due to poor blood circulation – so Zilch contains herbal ingredients that invigorate and promote blood circulation to reduce the swelling. 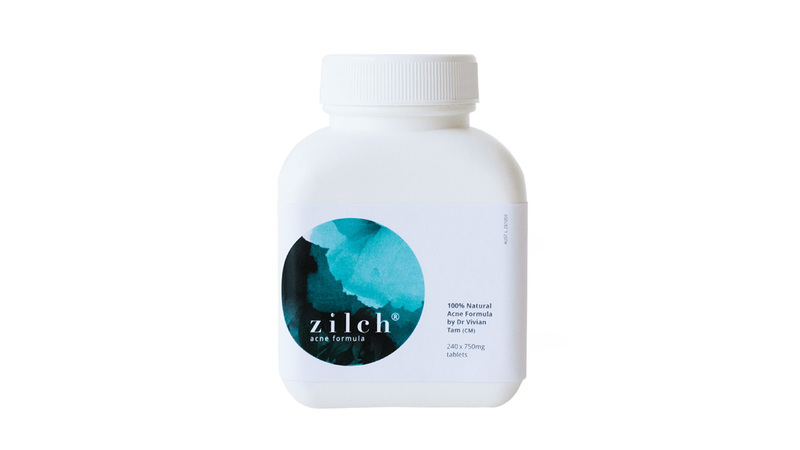 Just as importantly, Zilch Acne Formula also contains herbs that help with detoxifying the body, and balancing the heat pattern that Acne sufferers often have.